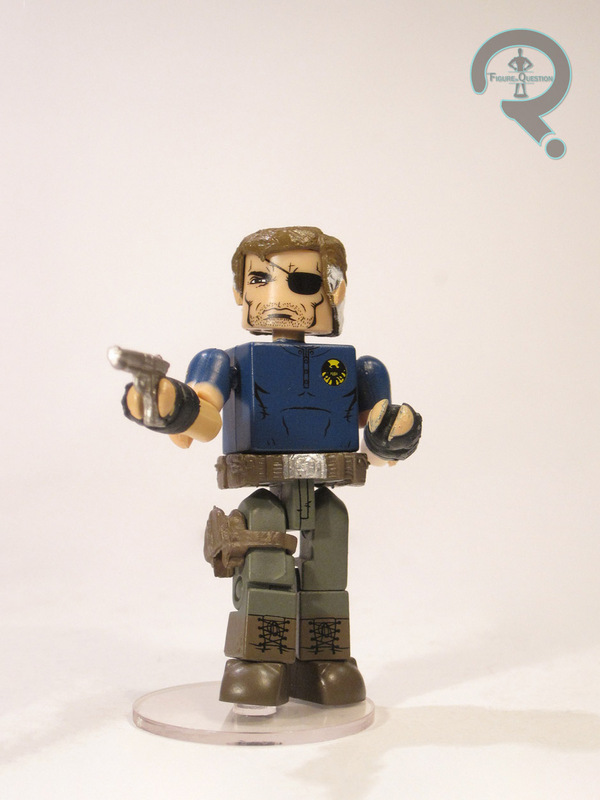 I mentioned yesterday that I just got a new shipment of Minimates, so I’m gonna continue looking at those today. I’ll be going back to old faithful, the Marvel line, this time looking at a boxset based on the recent Marvel crossover “Age of Ultron.” I won’t go into my thoughts on “Age of Ultron” itself, because I’m trying not to go all nerd-rage-y too often. Suffice to say, I did not care for it. But, they made Minimates, and Minimates have the ability to make most things better, so I bought the set. 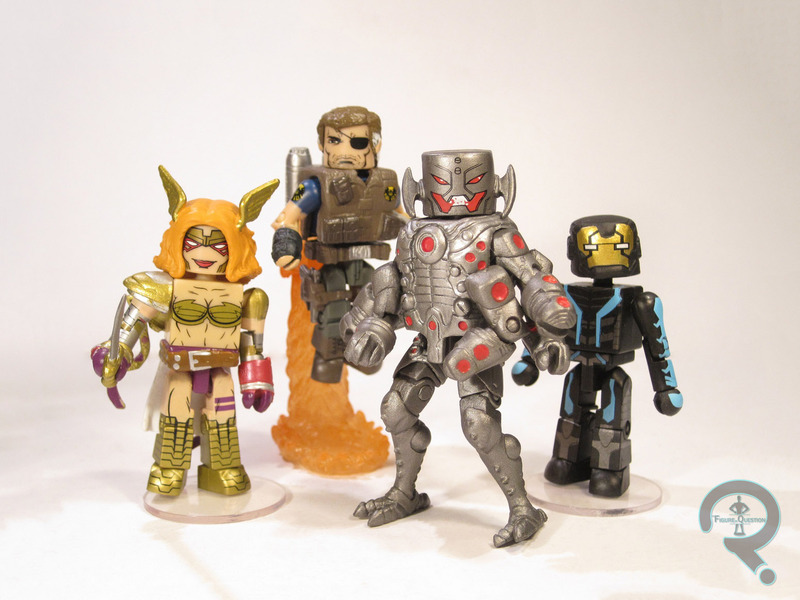 These guys were released late last year as a 4-pack centered around the aforementioned “Age of Ultron” story. They’re all based on the looks of certain characters from the series. First up, it’s the title character, Ultron. He’s not actually based on a look from the series itself, but rather from one of the variant covers to the series. It’s a decent design, so I have no issues with them deciding to use it here. 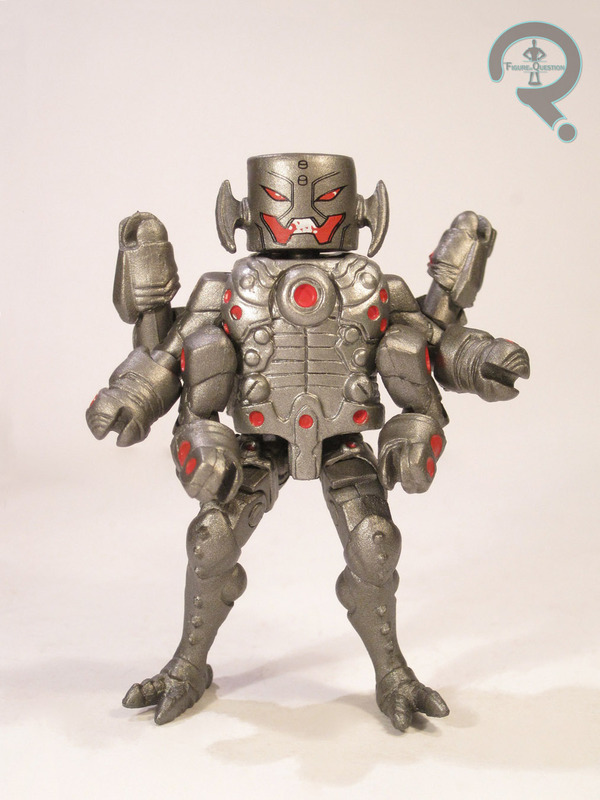 Ultron is built on the basic body, but thanks to a new set of lower legs and a few other add-ons, he stands roughly 3 inches tall and features 24 points of articulation (The 6 arms really help him there). Ultron has a buttload of sculpted pieces: head, upper arms, 3 different hand sculpts, torso, upper legs, and lower legs. The upper arms and one of the sets of hands are shared with the Marvel Now! Iron Man that was released in the 16th Toys R Us wave, but everything is brand new to Ultron. The amount of new pieces present is impressive. I had assumed, due to the quantity of sculpted pieces, that Ultron would be a bit more lax on the painted details. This is definitely not the case. 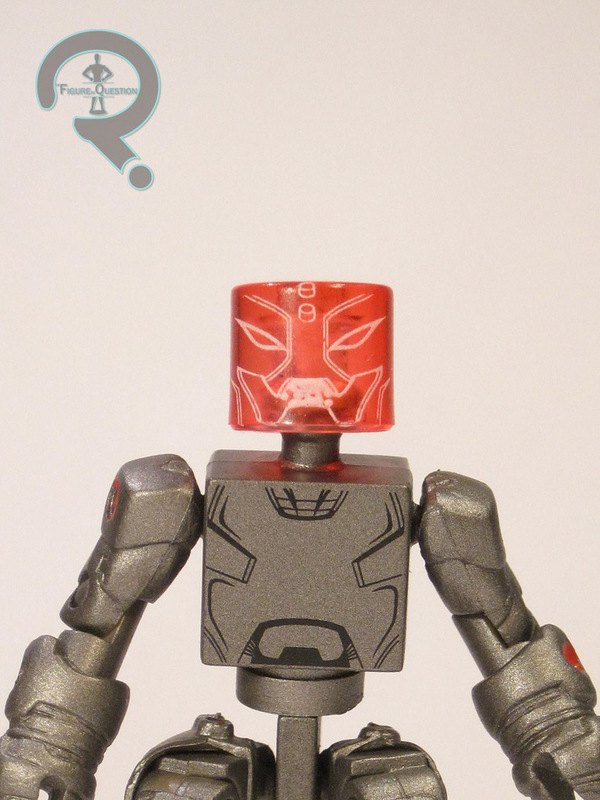 He’s got a detailed face, both on the Ultron head, and on the translucent red standard head underneath it. Plus, he’s got full detailing on the torso under the sculpted piece, allowing you to display Ultron in a more classic two-armed state if you so desire. Ultron’s only accessory is a display stand, which he can’t use due to the new foot sculpt. I’m willing to be a bit forgiving on that front, given how many add-ons he features. Next, it’s Nick Fury, Agent of Shield. What’s that you say? He doesn’t look like Samuel L Jackson? Yeah, this is classic Nick Fury, before the Ultimate Universe recast him in his more SLJ state. Specifically, this is the look Fury was sporting during the crossover. It looks to be a “business casual” style SHIELD uniform, with a polo shirt, combat boots and a tactical vest. I still prefer the basic SHIELD uniform, but this doesn’t look to terrible, and I suppose it does add some variety to the SHIELD line-up. 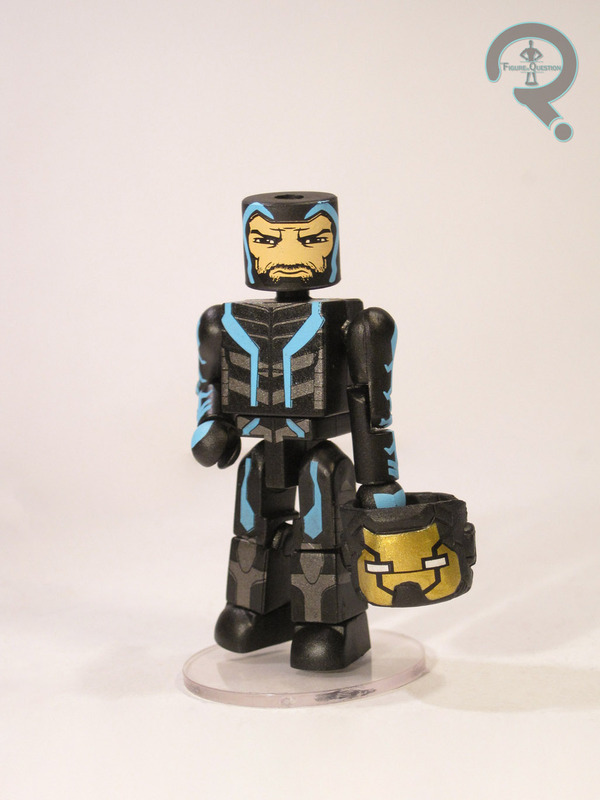 Fury is built on the usual Minimate body, so he’s got the standard 14 points of articulation, and he stands around 2 ½ inches tall. Fury features 6 sculpted pieces: hair, vest, gloves, belt, and a holster. The hair and holster are definitely reused, with the hair hailing from the Tomb Raider line, and the holster first appearing on the Avengers Movie Maria Hill, Fury and Widow figures. The belt and gloves might be reused, but I can’t say for sure. The vest is a brand new piece, and it looks really cool, and has the jetpack previously seen on Hope Summers and the Heavy SHIELD Agent attached to it. Apparently, the jetpack was supposed to be a removable piece, but a mix up at the factory led to it being glued to the vest. It’s too bad it can’t be removed, but it doesn’t ruin the figure. The paint detailing is pretty good. All of the detail lines are nice and sharp, though he does have a fair bit of noticeable slop, particularly around the sleeves and on the hands. But, the logos all look great, and he even has a fully detailed shirt under the vest. Fury includes a large gun, a hand gun, a blast base for his jetpack, and a clear display stand. Next up, it’s the biggest name in the set, Iron Man. He’s shown here in his slimmed down armor from the series, which also bears a resemblance to the armor he was sporting towards the end of Matt Fraction’s run on Iron Man. He’s built on the usual body, so he’s got all the typical stats. Iron Man is the most basic of the set, with only a single sculpted piece: his helmet. I think the helmet is a reuse from the Marvel Now Iron Man from TRU wave 16. Since he’s only got one sculpted piece, the figure mostly relies on paint. Fortunately, the figure delivers on this front. All of the paint work is nice and sharp, with none of the slop that was seen on Fury. Iron Man’s only accessory is a clear display stand. Last, and very much least in my opinion, it’s Angela. Angela! The big, highly kept secret from the end of the series! Oh boy, I’m so glad that was a thing. Yeah, I have, like, no interest whatsoever in this character. But, since she was packed in a set with other figures I wanted, I got her anyway. So, she’s built on the basic Minimate body, with all the usual stuff. She’s got 5 sculpted add-ons: hair, one shoulder pad (because kids dig asymmetry! ), two separate hand sculpts, and a belt with a sheath. Near as I can tell, all of these are new pieces. From a purely technical standpoint, all of its well-handled, with some pretty decent detailing. The paint on the figure is neither the best nor the worst in the set, which is fine. Angela includes a newly sculpted sword, and a clear display stand. I got this set in a recent order from my favorite place to get Minimates, Luke’s Toy Store! I really only bought this set for the Ultron and the Nick Fury, and after having the set in hand, I pretty much still only got the set for those two. Ultron is, without a doubt, the star of this set. I’d be hard pressed to find something I don’t like about that figure. Fury isn’t quite as good as Ultron, which is due mostly to the sloppy paint that plagues him. 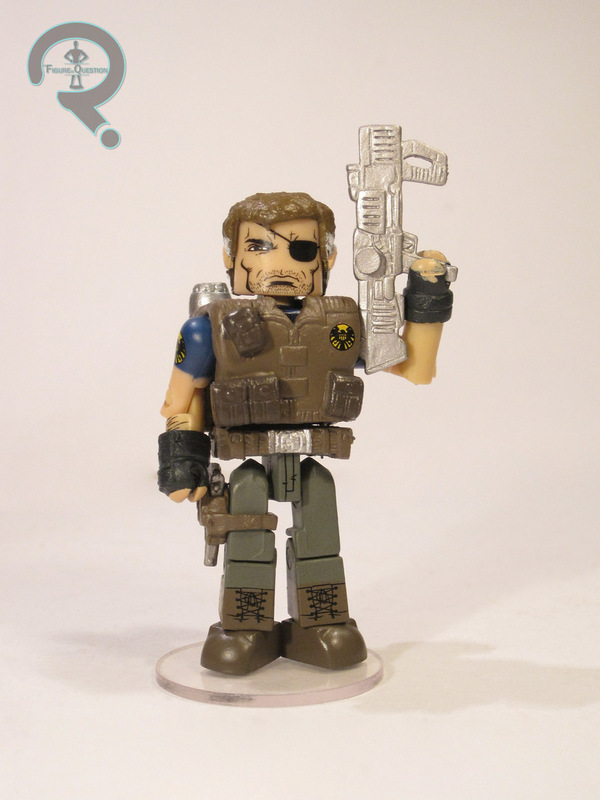 Still, he’s a nice update on the classic Nick Fury, who’s been in dire need of an update for a while now. Iron Man’s actually not too bad. I enjoy him more than I thought I would, and he really is well put together. But, at the end of the day, he’s just another Iron Man variant that is gonna get tossed in a box. Angela is Angela. This set has in no way swayed me on the character. I’m happy for those who wanted her, I guess, but she’s just not for me.